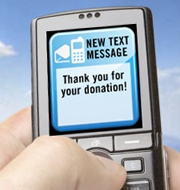 Accept donations for your charity with a tailor made premium SMS solution. Include your premium SMS shortcode on all your press material and receive a financial boost by reaching out to new supporters. Premium SMS donations is a service offered by Mensavox at no cost to interested charities.